I've been meaning to sit down and write about the Staedel, and in particular exploring some of the artworks therein. Basically the Staedel is the Art Gallery in Frankfurt that is dedicated to paintings - sort of. While they do have a sculpture museum just a short distance down the road, when you wander into the modern art section of the museum (which happens to be in the basement), you suddenly see how art ceases to have any real defining aspect - in a way who ever decided to split art up into paintings and sculptures and place them in two different museums really didn't seem to have any real understanding on the nature of art. Well, some places will have a separate gallery dedicated entirely to modern (or contemporary) art, such as Paris and London (though you will discover that there are no sculptures in the National Gallery, and whenever I ask a Londoner where I can find the sculptures they simply shrug their shoulders and make a comment along the line that art doesn't particularly interest them). However, here in Frankfurt they had moved the sculptures into the sculpture museum and left the paintings, and the modern art, here. As you have probably worked out, there are three sections to the museum, with the Modern Art located in the basement, art from the 18th and 19th Century on the first floor, and the art of the old masters on the upper floor. Mind you, if I had known how the museum was set up I would have started at the top and worked my way down as opposed to the other way around because, honestly, there is something about Modern Art that really seems to take a lot out of you. However, in these next couple of posts I'll be looking at various works of art located in the Staedel, including the exhibitions that we saw. The English translation on the website was 'Heaven on Display', which I have to admit didn't come across as well as 'Windows of the Heavens', which is the literal translation from the German. Anyhow, this small exhibition that was in one of the rooms off of the entry hall and contained a number of artifacts from the Kloster Alternberg, a secularised monestary (or more precisely a nunnery) in the town of Alternberg, a short distance north of Frankfurt. Unfortunately I wasn't allowed to take photos in here, but that is okay because I have since found images of the particular artifacts elsewhere. Anyway, the two main items were the Altenberg Alterpiece, which is normally closed, but had been opened for this particular exhibition. Along with this we have a wall hanging which depicted the story of St Elizabeth of Hungary, and the altercloth of the last judgment. The Kloster was established sometime between 1260 and 1270, whereas the alterpiece was completed sometime around 1330. Since the 1920s the wings of the altarpiece have been in possession of the museum, however this exhibition had it in its complete form. Fortunately I found some images on the internet, including one of the altarpiece (which is above). As you can see the central part is a carving of the Madonna and Child, which is probably the most common work of medieval (and early modern) art you will come across. Okay, while it is no doubt a popular topic of the time, we much also remember that the birth of Christ is central to the Christian faith - it represents God bursting into our world and becoming human like us so as to provide us a way of from the cycle of sin and death that we have found ourselves caught up in. On each of the wings are four scenes, the scenes on the left being when the angel appeared to Mary, the scene of where Mary and Elizabeth (the mother of John the Baptist) meet, a nativity scene, and the flagellation. On the right wing we have the slaying of the dragon, no doubt representative of the defeat of sin that was the result of Christ's death and resurrection, the King and Queen of the region at the time the alterpiece was created, the blessing of Mary (or it could actually be the immaculate conception), and the adoration of the magi. The picture below is a section of the atlarcloth that, well, lay over the altar, and this section depicts the adoration of the magi. This scene is where the wise men from the east, most likely Persians, though I do have this odd belief that one could have been from India and one from China. The Bible never actually tells us how many there were (or where they were from, except to say they were from the East, so they were obviously neither Greek or Roman), only that a number of wise men, or magi (which suggests that they were Persian), arrived within two years of his birth bearing gifts - it is that there are three types of gifts listed that gave rise to the myth of the three wise men. After the Kloster was decommissioned the regional rulers decided to take many of the works of art that were inside and parcel them out among themselves, which meant that many of them ended up in private collections (and many of them probably still are). However, over the decades many of the works of art have slowly found their way back into the public sphere (though no doubt a number of the pieces on display here were borrowed from such private collections, which is why photography was forbidden). The final piece which I will show is on display at The Met in New York, and is stained glass window depicting, once again, the adoration of the magi. This is something that appears to be a regular occurrence in the works of art in the collection, and seems to raise an important idea. In a way what is happening is that the wisdom of the world is acknowledging the reality of who the baby is claiming to be, though the suggestion is that the wise men come from the East (Persia and India) as opposed to the West (Greece and Rome). It is like our top professors appearing at a modern maternity ward and not so much paying homage to a child in a cot, but actually worshiping the baby and acknowledging him as God. The concept is actually quite absurd, and the only reason many of us don't see it as such is because we either dismiss it as a fairy tale, or are so used to the story that we don't really acknowledge how bizarre it really is. Anyway, we probably don't actually recognise the magi as being some of the top academics of the day, probably because we don't actually have any writings claiming to have come from any of them, and we also have a much more Greco-Roman view of the world. Anyway, I will leave the works of the Kloster here and move on to the works of the masters. I was originally going to follow my original route through the museum, but upon realising that an exhibition on relics from a medieval monestary really doesn't sit all that well with a exposition on a number of contemporary artworks. As such I decided that I would instead start at the top, and in my next post look at the works of art from the modern and contemporary periods (as well as some of the works by Georg Baselitz, which was the other exhibition in the museum). The other thing that I noticed is that there are awful lots of works in the museum, and if I were to look at every one I'd probably be here forever, so instead I'll look at some of the more prominent ones. However there is one problem: the painting that I wanted to start with I have no idea of its name, and while I was able to do a Google image search, all I came up with was the title "Die Einführung der Künste", which I have to admit did come from the Staedel website, though the website also indicated that it was painted by Philipp Veit between 1834 to 1836, which left me scratching my head because I felt that it was a bit too late for the 'Old Masters' period. Still, if that is what the website says, then I'm going to run with it. However, if you do consider the painting, you will notice that there seems to be a merging of the old and the new. Veit was actually pretty conservative and was a member of a Roman Catholic sect known as the Nazarene, which tended to hold fast to the medieval traditions. In a sense there is only one type of legitimate art and that is religious art. Pretty fundamentalist in a sense, but then again there are quite a number of fundamentalist cults who believe that all art is bad (through shalt not create an image), and the only literature one should read is prescribed literature. Yet it also says something about the nature of Christianity, and that it isn't a backwards religion that hinders progress, but it is a religion that is vibrant and cultural. The idea suggests that before the introduction of Christianity Germany basically made up of disparate tribes that wandered around beating up Romans for fun. In time Christianity had a transforming effect upon the population, in a way civilising them and causing them to settle down so that one's excess energy is exerted through art, literature, and culture as opposed to bashing people's heads open. Well, it seems that the founder of the museum, Johan Friedrich Staedel, which happened to be a pretty wealthy, and a quite influential banker, had a vision for this museum. 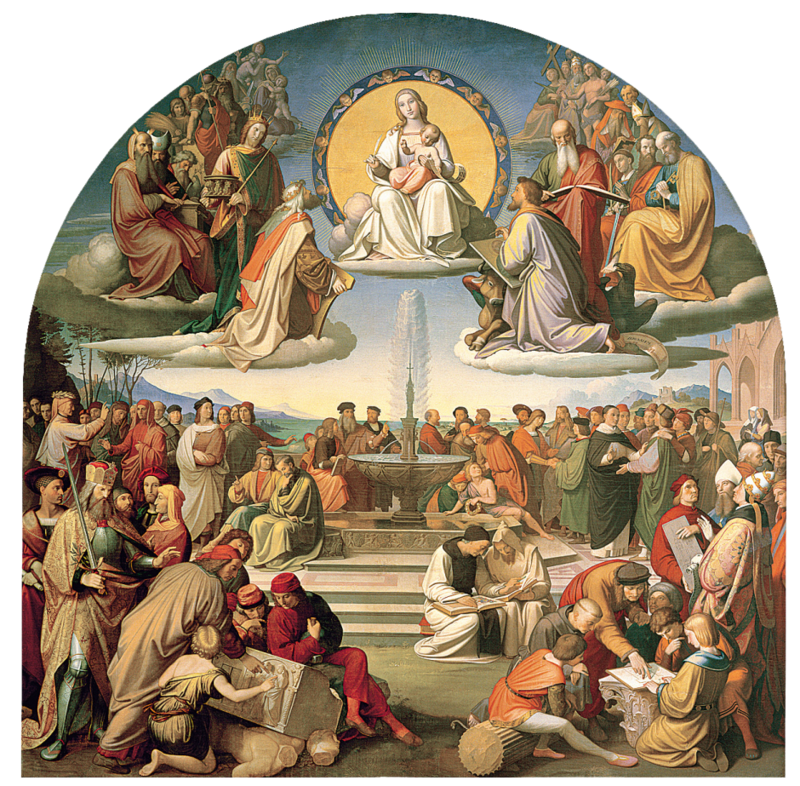 In fact these paintings, the previous one and the present one (Triumph of Religion in the Arts, by Overbeck) where not only commissioned by Staedel, but commissioned for a specific purpose, and that was to promote religion through the arts, in particular a rather conservative branch of Catholicism. Once again the above painting evokes the religious art of the medieval ages, and we have the image of the Madonna as the central focus, and is flanked by the twelve disciples. However, on the ground we have a gaggle of artists, all falling over each other to capture the image that is the newborn Christ. In another sense, with the rise of the scientific and secular world through the age of enlightenment we see a movement away from the religious. This museum was established during the heart of the Romantic period, when the focus was more upon the classical as opposed the the Christian. It seems that there was an attempt being made to try and create a movement within the artistic community to move back to the traditional, religious roots as opposed to the secular world as it now stood. The above painting is by Van Cleve and is known at the Trypich with the Lamentation. Actually, calling it a painting is probably a little inappropriate as it is more of a three paneled work that would normally go on display in a church (and you certainly see quite a lot of them in the various churches around Europe). This one is of the anointing of Christ's corpse, an event referred to as the lamentation. This scene occurs just after he was taken down from the cross, and his corpse anointed before being wrapped and placed in the tomb. On the right panel you can see somebody holding the crown of thorns, while on the left panel somebody is holding the cloth that would be wrapped around his head. However, what is interesting is that the image of his face is already on the cloth, as if its use had been foretold. The Sybil was a prophetess from the Ancient World who was said to be able to predict the future, though as is the case with most prophets they generally spoke in riddles. There was one in Greece, and one in the Etruscan town of Tibur. This particular Sybil was said to have been approached by the emperor Augustus to be asked whether he should be worshiped as a god. I suspect the answer was yes, because he did end up claiming to be a god, and after his death was deified. However, the above painting is not of that event, but of an apochryphal event that occurred sometime later. The Sybil was said to have prophesied the coming of Emperor Constantine, who would banish the enemies of Christianity and then establish it as the sole religion of the empire. However, that sounds rather dubious, the prophecy that is, because it appears to be similar to the Donation of Constantine, a forged document that was said to have been given to the Pope to take charge of the Roman empire. Interestingly, the Sybil also went as far as to predict the coming of the anti-Christ, after Constantine established his throne in Jerusalem, who would rise from the tribe of Dan and then rage war against Christianity. The creator of the Pfullendorf Altar is unknown and as such is simply known as 'The Master of the Pfullendorf Altar'). Only four panels of the altar survive, one of which is in the Staedel (as shown above). The altar piece on one side depicts the life of the Virgin, while the other side (which has been destroyed), depicts the passion (that is the events in the week leading up to Christ's death and resurrection). In the above scenes we have the annunciation (where the angel appears to Mary to tell her that she will give birth to the Christ); the visitation, where Mary meets with Elizabeth, the mother of John the Baptist; the nativity; and what is apparently 'The Death of the Virgin', though it looks more like the presentation at the temple than anything else. Another work of which we don't know the identity of the artist, so we refer to him as the Strasbourg Master. Anyway this is a crucifixion scene, but it is one with a difference in that there are two different styles: the Rhennish style in the background, and a more Germanic style in the front. One thing that you notice about many of these paintings is how anachronistic many of works are: they tend to use a modern style of dress as opposed to traditional Roman styles. Actually, one of the main reasons is probably because they didn't know how Romans dressed, or if they did, the particular artist, and the audience didn't. This particular painting is where Christ is being lifted up, while we see the guards playing dice in the foreground, and the tomb in the background. Further, notice how the location appears to be very much a temperate European climate, with what appears to be a European city in the background. However, I do note that there does appear to be some Middle Eastern looking characters in the painting. This painting caused quite a stir when it was acquired by the Staedel becuase it is of a pretty controversial topic - the Reformation. Remember that the Staedel was originally set up by a rather conservative catholic who belonged to an incredibly Conservative catholic sect. So, when a painting of a reformer appeared the strictly catholic curator resigned in protest. In a way it seems a little surprising that even in the early 19th century the Reformation was still quite a sore point to many of the Catholics in and around Germany. In a way we don't seem to be as concerned these days, though since I am not Catholic I personally can't tell. I should point out that this painting hangs at the entrance to the Old Master's Gallery, very visible to those who ascend the stairs. Upon looking at this painting at first it seems that it may has a religious under-tone, particularly since the figures in the foreground could quite well be Joseph and Mary. However, it also appears that they may be in Egypt, if the ruins are anything to go by. However, the presence of the cattle suggest that this may not be the case, until I look at the character that they are speaking to - it could be that the cattle belongs to this person. Yet there is no mention of anything religious in the title, it is just called a 'Landscape with Ancient Ruins', which suggests that maybe the painter left it for us to work it out ourselves. Yet as I look into the background I see a place that looks suspiciously like Ancient Rome, or at least the ruins of Ancient Rome, and the place in the foreground also has a Roman feel about it. Thus, the whole flight to Egypt idea is no doubt incorrect. Instead, what we are looking at is a vision of what remains of a once great empire - in a sense what we are being told is that all empires are destined to fall, and when they do fall it does not mean that it is all over - life continues, and in a way prospers. Sure, there will no doubt be a period of chaos and suffering, be we have become too comfortable in our lifestyles that if our society were to collapse we would be in an awful lot of trouble, especially since the division of labour means that we have become so specialised that we would know the first thing about foraging for, let alone growing, food. Yet life goes on, and can be prosperous, though our view of prosperity is different to the prosperity in this particular painting. This is in a way a pastoral idyll, an idyllic scene of beauty and serenity. We have once view of luxury and peace, but the artist of the pastoral piece sees it in a different way - simplicity is actually the key, and a desire to live a simply life uncomplicated by the world around us should be a bigger goal that attempting to make our lives as noticeable, and as extravagant, as possible. I could be wrong, but my understanding was that Orpheus was the Greek Hero who invented music and the musical instrument (just as Jason was the hero who invented the boat). Anyway, Orpheus wasn't just a good musician, he went way beyond being even a great musician - he was one of the best, and while I would suggest that even the great musicians of our time would pale in comparison with his genius it pretty much goes without saying. In a way, his music was so good that even the animals would stop and listen to it, as is the subject of the above painting. However, a Greek legend wouldn't be a Greek legend if there wasn't some really nasty and sharp edge to the story (which is one of the reasons that I love Greek stories - they aren't afraid of making their heroes human, and flawed). Orpheus' wife, Eurydice, died on their wedding night when she was bitten by a serpent. However, Orpheus was allowed to descend into Hades and rescue her, on the grounds that on the way out he did not look back. However, as he was leaving, with Eurydice following close behind, he heard a noise, looked back, only to see Eurydice return into the underworld as a shade. Thus, I come to the end of the first part of my post on the Staedel, and what fitting way to finish off this post with one of the Staedel's treasures, a painting by the master of the masters, the only old master who is known by his first name (everybody else is known by their last), Rembrandt - The Binding of Sampson. I am reminded again of just how much of a genius Rembrandt was. Seeing his works in person is even better, of course. No picture can capture the magic of the original.